But this bread was good! Semolina gives it a very special flavor, and it has such a crunchy crust and such a soft crumb. So I am finally posting it, if you don’t own cups, just grab a graduated measuring cup: 250 milliliters is one cup, to obtain the half cup pour up to 125 ml. … yes, you are using milliliters to measure flour, no kidding! 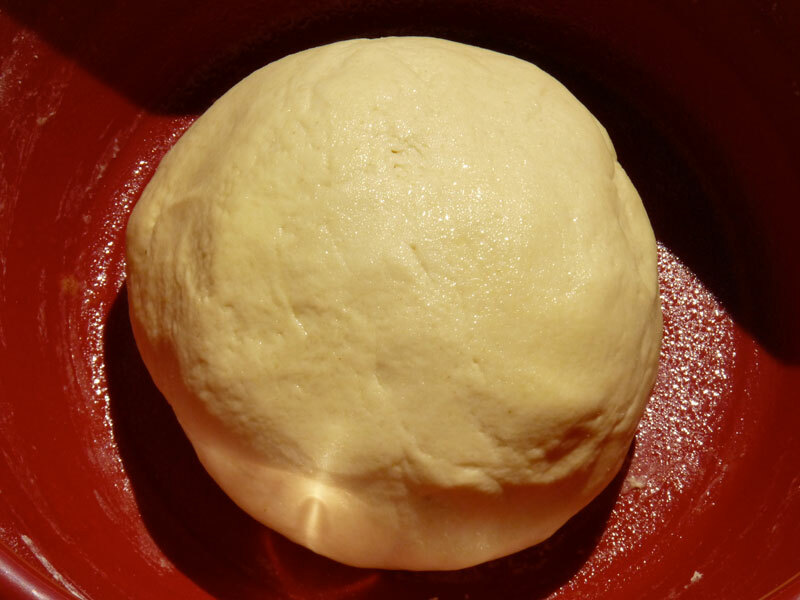 Mix the water and the yeast, cover and let stand for 10 minutes. Add the semolina and stir it in. Add 1 cup of bread flour and the salt, mix everything and check the consistency, if it is too sticky add more flour, a little at a time. 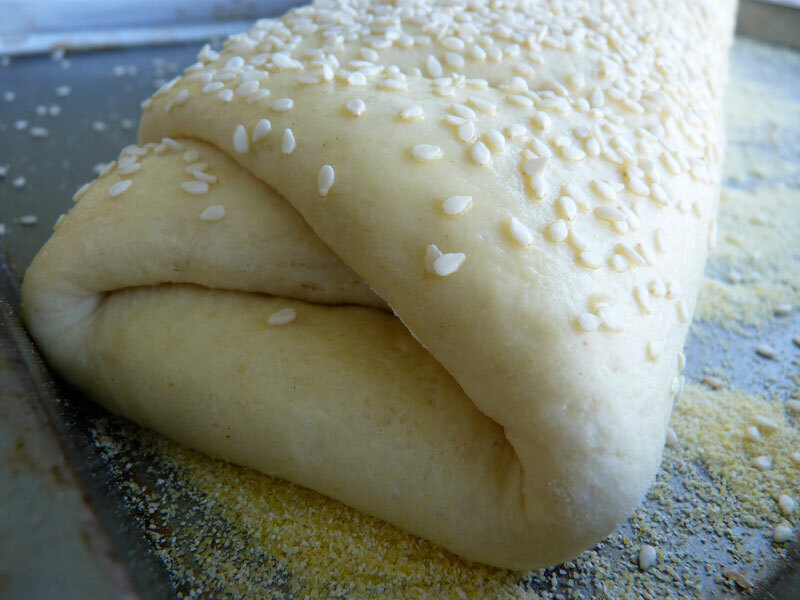 It’s a bit harder to work with semolina, it needs to hydrate, so let your dough rest for 10 minutes. 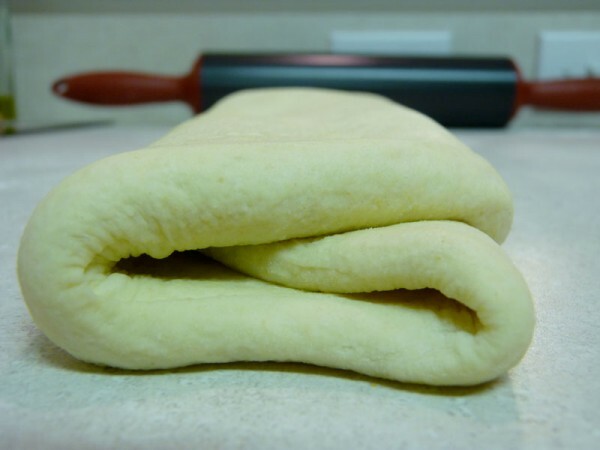 Now knead your dough as usual for 10-15 minutes. On a floured surface, stretch the dough out and then roll it back and turn it a little to stretch it in the other direction. 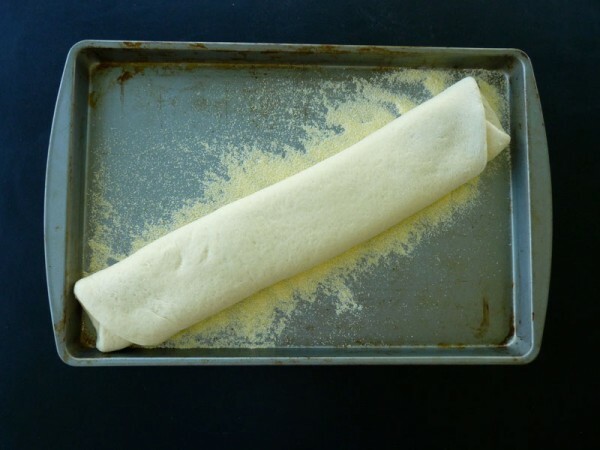 Sprinkle with some oil a large bowl, toss the dough inside and roll it around to coat everything with the oil. Cover with plastic wrap and let rise in a warm place. In Florida a warm place used to be the countertop, almost too hot sometimes, now in Berlin I use the trick of the oven. 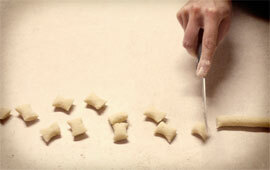 The trick is, while you are kneading the dough turn on the oven at the minimum temperature, that should be 50ºC (120ºF). 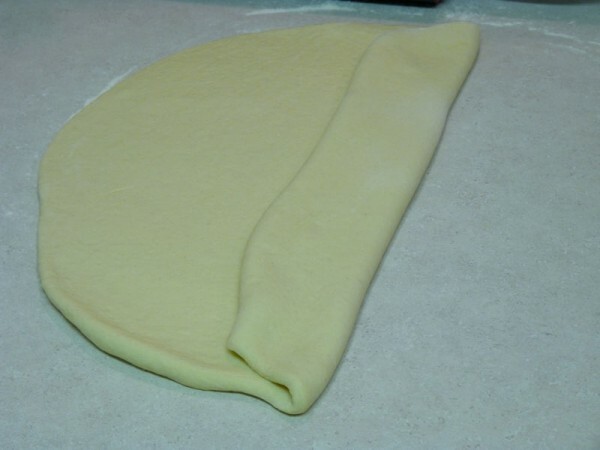 Few minutes before you are done kneading, turn off the oven, keep the oven light on and then transfer the bowl with your dough in the oven and shut the door behind it. The light of the oven will maintain a slightly warm environment. The dough needs to triple in size. This may take a few hours. At this point I am pretty sure I just went ahead and shaped the dough into a loaf (I have no patience) but the original recipe calls for one more leavening phase, so here it is: take the dough from the oven, punch it down, knead it again and position it again in the oiled bowl, coat it with oil and let rise again until it doubles in size (it should take 45 minutes to 1 hour). 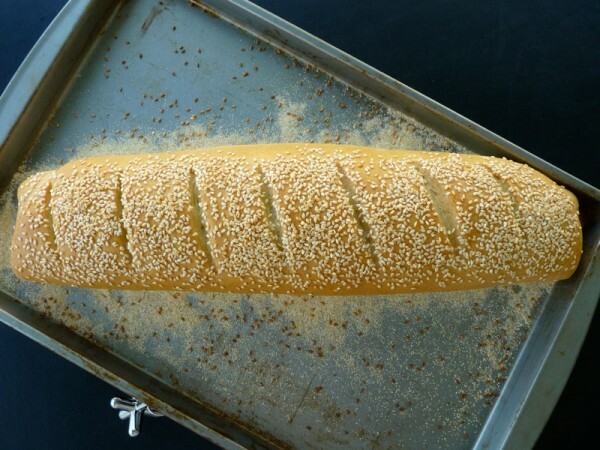 I shaped the dough into a long baguette-like shape. First I rolled the dough out into a more or less rectangular shape, then I folded it in large flaps. Remember to tuck the last flap under the bread. It’s hard to describe, but easy to understand from the pictures below. Preheat the oven to 220ºC (425ºF). 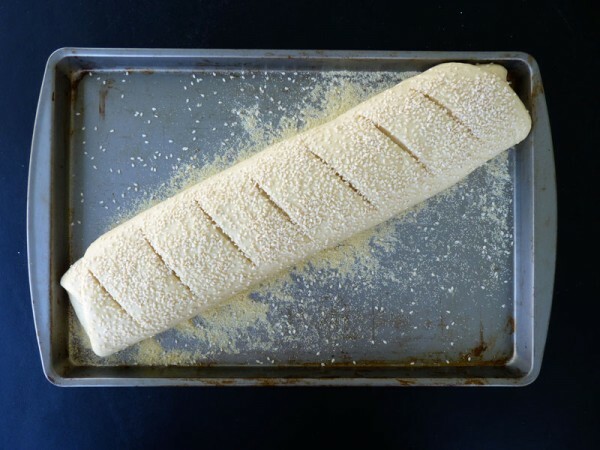 Sprinkle the baking sheet with cornmeal and lay your semolina loaf on top of it and let it rise for 30 minutes. 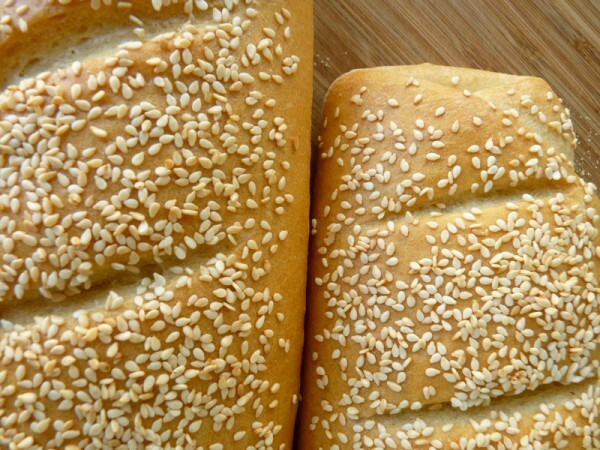 When the bread has puffed again, prepare an egg wash mixing the egg with one tablespoon of water, brush the loaf with the egg wash, and sprinkle with sesame seeds (careful that sesame seeds can result bitter if used abundantly), you can also sprinkle with some corn flour for a more rustic look. 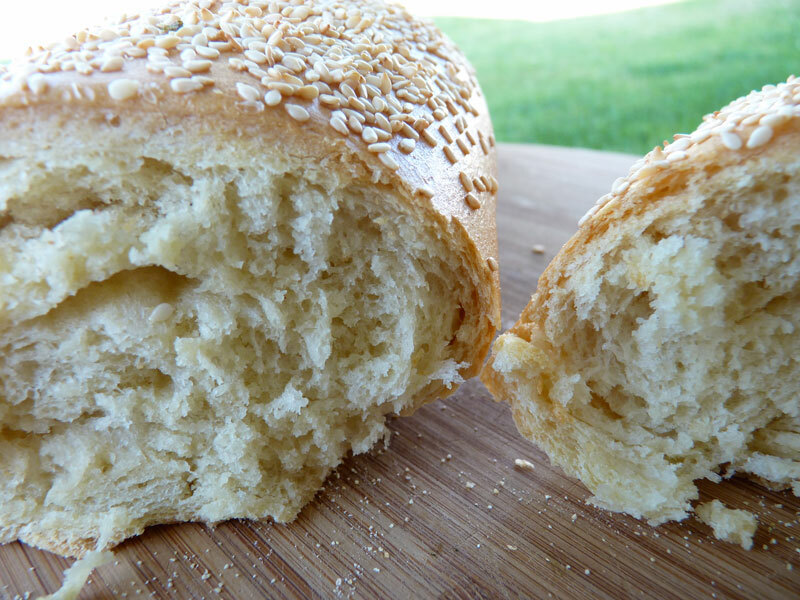 Finally, slice the surface of the semolina bread with parallel cuts. Transfer to the oven, turn the temperature down to 190ºC (375ºF) and bake for 45-50 minutes until the semolina loaf is golden brown. Wait until it has cooled down before slicing the loaf. … I can never wait! I think I should make this semolina bread again soon! PS: if you are in the US I highly suggest you the brands of flour used by Macheesmo, that is King Arthur’s Flour and Bob’s Red Mill. I tried a lot of flours before settling for these two, I always obtained great results with these, and the flavor was the best. Here in Germany I am still going through different brands and different kinds of flours. A couple of months ago I bought by error a packet of Roggen Mehl (rye flour), boy was that horrible! I use it sometimes to dust the surface when I am rolling some dough and that little still manages to taste bad!